Manila—(PHStocks)—Philippine stocks recovered Thursday, 18 July, as investors take a positive cue from statements by the US Fed’s Ben Bernanke on Wednesday, 17 July. The benchmark Philippine Stock Exchange (PSE) index increased by 1.12% to 6,648.35 – recovering from the previous day’s 0.13% decline. All counters were in the green, with the Property sector leading with a 2.06% jump. The Services sector was up 2%, while the Industrials recovered with a 1.26% gain. Overall, the wider All Shares index was up by 1.11%. Trading improved from yesterday. 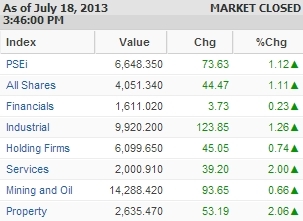 Value turnover today reached PhP7.4 billion on 2.36 billion shares traded. There were 109 gainers against 35 losers, while 46 stocks were flat. Today’s most active stocks were Philippine Long Distance Telephone Co. (TEL, PhP2,956.00, +2.43%), Universal Robina Corporation (URC, PhP127.00, +2.25%), SM Investments Corporation (SM, PhP950.00, +0.64%), Bank of the Philippine Islands (BPI, PhP92.50, +0.54%), Alliance Global Group Inc. (AGI, PhP24.80, +0.81%), San Miguel Corporation (SMC, PhP87.80, +3.29%), Ayala Land Inc. (ALI, PhP30.95, +1.81%), Metropolitan Bank & Trust Company (MBT, PhP110.30, +0.55%), Energy Development Corporation (EDC, PhP6.00, -0.17%), and Bloomberry Resorts Corp. (PSE: BLOOM, PhP11.36, +5.19%).